Legendary Kingston musician Joe Chithalen had a dream that anyone should be able to learn how to play music, regardless of their socioeconomic position; that’s why Joe’s Musical Instrument Lending Library (Joe’s M.I.L.L.) was created in his memory following his death in 1999, giving everyone a chance to borrow musical instruments for free, like books from a traditional library. There can be little doubt that Joe would have been a fan of the Venezuelan program El Sistema, which focuses on positive social change by way of teaching music to underprivileged children. El Sistema has already inspired similar programs in Canadian cities like Ottawa and Toronto. This year, Joe’s M.I.L.L. will team up with the Limestone District School Board and Queen’s Conservatory of Music to launch Sistema Kingston, an intensive after school program for at-risk children. 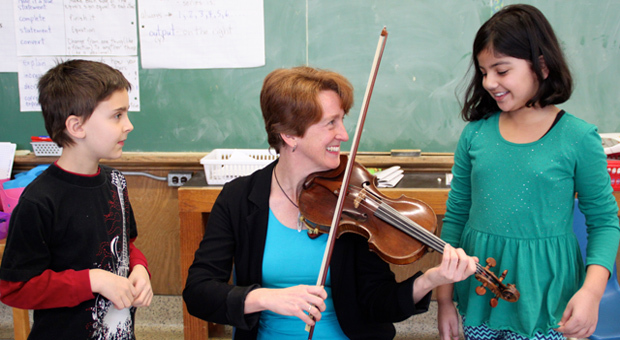 Sistema Kingston will begin in the fall of 2015, with 20 students in Grades 2-4 from First Avenue Public School participating. It will focus on choral training as well as string instruments, which will be supplied and maintained by the M.I.L.L. Children will learn to play in an ensemble, which Snider says adds depth to the many skills they already gain from learning an instrument. The main goals are to foster music appreciation in students, and allow the young musicians to achieve their full potential. He notes that Sistema Kingston is a great example of the kinds of collaborative projects the M.I.L.L. will be pursuing more in their new home at the Tett Centre for Creativity and Learning.